Enchiladas. Dating back to the Mayan times, enchiladas remain a savory meal, suitable for both afternoon celebrations and evening events. Tortillas, filled with meat, seafood, vegetables, beans or all of these ingredients together and covered in a delicious chili sauce is simply a must-try! Chiles en nogada. This delicious traditional dish is a top selection for theme parties as it boasts all three colors of the Mexican flag. It includes delicious poblano chillies frilled with a mixture of chopped meat, fruits and spices, complimented by a walnut-based cream sauce and pomegranate seeds. This historic dish was first served to Don Agustin de Iturbide, who is known as the liberator and Emperor of Mexico. Tacos. Have you ever been to a Mexican themed party where tacos weren’t served? We haven’t. And there is a good reason why tacos are so popular - they are fun, delicious, easily customizable and come with plenty of fixings to suit every preference: onions, cilantro, lemon, guacamole, hot or mild red and green salsa… And they look good on your table, too! Our other selections include include pico de gallo, guacamole, quesadillas, savory soups and stews, specialty seafood dishes, grilled fajitas, burritos and crunchy nachos… Everyone will find something that satisfies their palate - this is what makes hearty, well-cooked Mexican meals so popular all over the world. 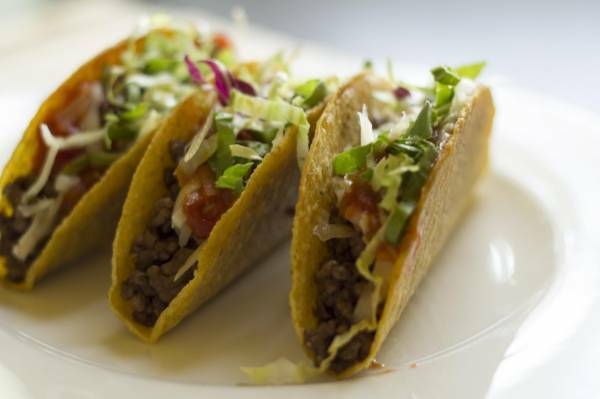 Rich in both colors and taste, and just simply delicious, Mexican food catering is sure to leave your guests satisfied. How many people are going to attend your event? Deciding on the headcount of your party helps in determining the number of nacho trays and tacos that your party will need, and will make the communication with your caterer much easier. Is your event in the morning, afternoon or at night? There are light Mexican dishes, that are more suitable for the earlier hours of the day, and then there are the heavier ones, perfect for parties that take place in the evenings, so taking this into account when creating your menu helps in perfecting your selection. What dishes do you personally prefer and want to be served at your event? If you just love tacos, make sure they’re included in your menu. If the person you’re throwing the party for can’t stop talking about how much they enjoy enchiladas, tell that to the caterer. This will create a customized, one of a kind selection that expresses the values and character of the occasion. Mexican food catering is always a good idea. Especially, when you work with caterers that you can trust. At Coast Chef we prepare all of your favorite, well-cooked Mexican dishes, and make sure that you and your guests have a fabulous time trying out the different delicious meals. Call us at (619) 304-0450 and tell us about your event. We’ll be sure to perfect your menu to every detail and help you create a memorable celebration with our delicious event catering.